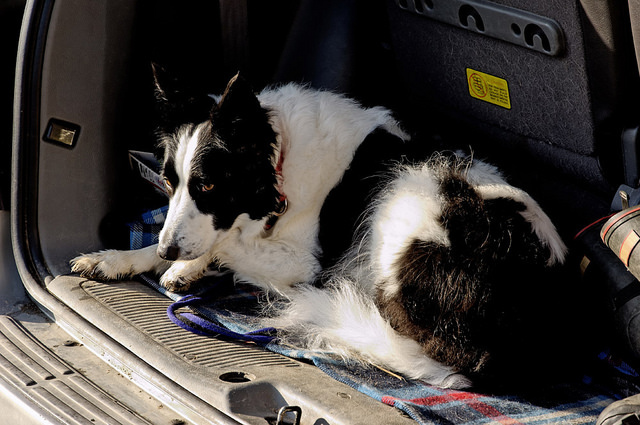 If you are like most – your pets are an integral part of the family, and therefore accompany you on many car rides! In honor of February’s Responsible Pet Owners’ Month, here are a few doggie travel tips. Whether running out to the store or going on an extended trip, make sure that you take your dog’s collar, ID tag, leash and water/bowl. If you haven’t already done so, the Humane Society recommends having your dog micro chipped in case of separation. This can be done at your local veterinarians office. Safety first! It turns out Sir Isaac Newton was right about those laws of motion! Just as you wouldn’t travel without a seat belt, make sure your pet is safely contained in the back seat in either a crash approved crate or a belted safety harness while traveling. This also helps in decreasing driver distraction. When traveling long distances, remember to stop frequently. Cesar Milan recommends taking breaks every 2-3 hours so your canine companion can stretch his legs, do his business, and grab a quick drink. Whether traveling near or far with your furry friends, we at Don Robinson Mitsubishi wish all of our readers and their canine companions a safe and happy Responsible Pet Owners’ Month.